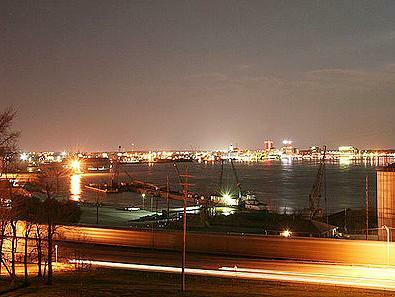 EVANSVILLE, Indiana, January 6, 2011 (ENS) – The city of Evansville has agreed to make extensive improvements to its sewer systems that will reduce the city’s longstanding sewage overflows into the Ohio River at a cost that may exceed $500 million over the next two decades. The settlement reached with the federal and state governments today would resolve a lawsuit filed by the United States and Indiana in September 2009 against Evansville for alleged violations of its Clean Water Act discharge permits. Evansville’s sewer system has a history of maintenance and system capacity problems that result in it being overwhelmed by rainfall, causing it to discharge untreated sewage combined with stormwater into the Ohio River in southwest Indiana. Under the settlement, the city will improve operation and maintenance, as well as develop and implement a comprehensive plan to increase capacity of its sewer system to minimize, and in many cases, eliminate those overflows and basement backups, particularly in the older part of the city. In addition to improving its sewer system, Evansville has agreed to pay the United States a civil penalty of $420,000 and the state of Indiana a civil penalty of $70,000. Evansville will also implement an environmental project that will connect homes with failing septic systems to the city’s sewer system at a cost of more than $4 million. The plan must be fully implemented by calendar year 2032 or 2037, depending on the financial health of this city of approximately 163,000 people. Measures to improve the capacity, management, operation, and maintenance of its separate sanitary sewer system to eliminate overflows of untreated sewage will begin immediately. The city also will take immediate steps to upgrade the treatment capacity of its two wastewater treatment plants. In total, the measures required by today’s settlement will help eliminate over four million pounds of pollutants and hundreds of millions of gallons of untreated overflows discharged into the Ohio River and Pigeon Creek every year. “Evansville’s inadequate and aging sanitation infrastructure allows potentially harmful sewage and storm water overflows into the Ohio River,” said Ignacia Moreno, assistant attorney general for the Environment and Natural Resources Division of the Department of Justice. “Like other settlements we have reached in municipalities across the country with outdated sewer systems, this settlement will protect public health and improve the water quality for the local community,” Moreno said. In the past, the U.S. government has reached similar agreements with numerous municipalities, including Jeffersonville, Fort Wayne, and Indianapolis, Indiana; Nashville and Knoxville, Tennessee; Mobile and Birmingham, Alabama; Cincinnati and Toledo, Ohio; Atlanta, Georgia; Miami, Florida; New Orleans, Louisiana; Baltimore, Maryland; Los Angeles, California; and Louisville, Kentucky.